Most of my photography is spontaneous. I might have an idea of what I am going to shoot, when I head down the Big Sur coast, I am going to try to shoot condors. But I don’t usually have a shot in mind. Yesterday was different, I found myself at the right spot at the right time to get a shot that I have wanted for a couple of years. Elkhorn Slough is a wonderful place for birding that I try to get to a couple time a year. 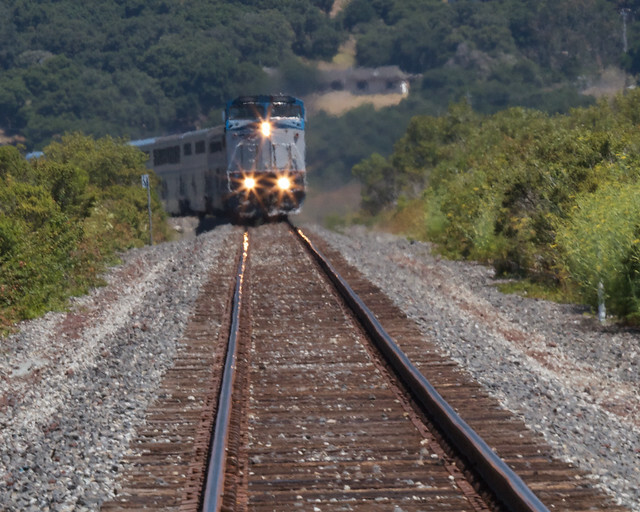 But running through the middle of it is one of the main north south railroads in California. And every day, around noon, the Coast Starlight rumbles over the tracks. 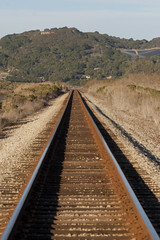 I have taken shots of the tracks and of the train, but always wanted to get one with a train coming down the tracks. And I finally had my opportunity. Now standing on the tracks before an oncoming train is not something you do lightly. And while I was shooting with my long lens and was well away from the tracks by the time the train arrived, you will notice that I was not perfectly centered on the tracks. I was inching my way off as I shot. Playing chicken with a train is not my idea of fun.